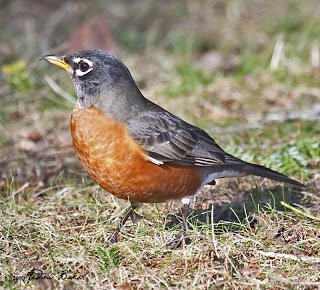 Home › Uncategorized › A Robin in the Road on Thanksgiving Day! A Robin in the Road on Thanksgiving Day! I am thankful for this spectacularly warm and sunny day! I am thankful that my daughter has healed. I am thankful that my son perseveres despite a challenging business environment – J. D. – you will overcome! I am thankful for my partner, who through his deafness has taught me to communicate in ways I never thought possible. I am thankful to have him next to me each night. I am not thankful for his snoring! I am thankful that my “sort-of-stepson” is now finding his way. I am thankful for friends – new and old. I am thankful that as I sit here typing away, my cockatiels happily flap their wings and sing “Yankee Doodle” in rhythm to the clicking keys. I am thankful for the rambunctious, never-ending joy brought to me by my three Boston Terriers who are actually asleep at my feet as I write. I am thankful for my dear old, reliable steed, Buzzy who takes good care of me as we amble about through country fields and woods, just the two of us.